Disclaimer: The information provided on this link is based solely on public data available on the BBMP website. The information has not be modified or altered in any manner and does not contain any opinion or views of IIMB or its Management or employees. Please seek legal opinion to validate this information before you act upon it. Is your property on a Rajakaluve? Here is a way to find out. BBMP has notified properties with survey numbers that are encroaching on BBMP website. Our portal makes it easy to access these documents and give a summary view. In addition, we give indication of possible notification from BBMP in future based on documents collected from Land Records Website. Use the drop down menu on the left to select the (taluk, hobli, village) combination for your property. A list of all affected survey numbers will be displayed below with links to relevant documents. Your survey has been notified by BBMP for encroachment. Your survey has not been notified by BBMP. However, as per Revenue Department, rajakaluve passes through your survey. Your survey is mentioned either in the BBMP or Revenue Department documents but it is not clear that you are encroaching. No encroachment table for this village due to unavailability of data. Please click view button in table above to see files here. Note: By clicking the link above you will be leaving IIMB-RERI portal and visiting a third-party site. Hi, There are no Specific identification/ named of Rajakaluve boundaries such as PRIMARY, SECONDARY AND TERTIARY Rajakaluve, Land owners says that, land situated near TERTIARY Rajakaluve, so we have left out required meters from it but how we could identify from the plans available here? Please suggest. Hi i have zeroed on the plot #16b in the survey no 68/1 in halgevadrahalli village and its not clear if rajakaluve enchrochment is near by it. Can you please add information on the survey no 68? can you please upload the survey no 112 village map? i want to buy survey No 112 site no 262. its near by rajkalve is there. pls let me know can i buy this property? What is the status of telecom layout jakkur area sites marked for SWD? Hi All, I am planning to purchase a plot in SY 20/2, uttarahalli Manavartekaval and want to know if this comes under rajakaluve. Please help citizens of THUBHARAHALLI ward 85 ..shocking could not believe that BBMP it self came forward to close the Rajkaluve and making road to Builders and land developers..
Hi Sir, Yadavanahalli survey number 84 have a rajkaluve. But how can I know if it is a primary or secondary drain? is servey number 53/54 is encroached or nearer to rajakaluve? can I buy this? Hi Sir, My Survery number is 107/2. Is it under RajaKaluve. Please let me know. In LV Enclave site number 43 and serve number 9/16 in ward number 12 which comes under myadarahalli approaches rajakaluve . please answer it. BBMP fails to remove encroachment, for the SY No.6 HAL 3rd stage Kodihalli bangalore. I my self have given many complaints to BBMP commissioner and to SWD no initiative has taken till now. Even though High Court has directed to clear the encroachment of rajakalauve BBMP has not teken in to consideration of the High court order and leads to contempt of court ????? BBMP fails to remove encroachment, for the SY No.6 HAL 3rd stage Kodihalli bangalore. I my self have given many complaints to BBMP commissioner and to SWD no initiative has taken till now. This Sy No Belongs to our ansisters property. Why you people getting salary please reply to this????? kattigenahalli.jala hobli,yelahanka,bangalore. Survy numer; 220 and 40 there is water line passes throught it,but it not shown in rajakaluve list.could you let me know is it safe to buy land in it. My site no is 8 in huralichikkanahalli village, hesaraghatta hobli.. will rajkalve be a problem.Kindly reply. Survey no 257 is in yellow belt pls tell us is it more risky in buying. Conduct a thorough and diligent examination with the experts. Survey no 63, Hammigepura is marked in Grey, what precaution to take before buying plot there, also is it worth Risking? This is BDA 6th Stage 10th Block layout. Sir, in survey no. 62 , taverekere village, begur hobli, Bangalore south . Want to purchase a property in j cross road in that survey no. 62. Does rajakaluve come to this survey no. Please give us details.can we get sketch of raja kaluve. How many meters or feet should be left free in our sites next to nala or rajakaluve?? Please clarify.. I have site no 11 at RK Garden survey no 13/*/* , Mallasandra Grama, kagglipura village panchayat, Vajarahalli main road Bangalore 62. can you pl tell me is there any rajkaluve running through in this RK GARDEN Layout . Hi, I have a site in Gidadakonenahalli Survey number 1/9, Yeshwanthapura Hobli, Bangalore North Taluk. Can you please let me know which all sites come under rajakaluve? Sir. I want to know abt site 70/3. Exactly beside that a small drain is going. But in other map it's shown as red line means that is road. So can u plz help me is it problem free Appartment in 70/3 as per Raj Kaluve. My property is in K narayanapura. Sy-31/3 just behind my site is the rain water drain. Will there be a problem if i construct my house. Can someone please advice I'm quite in a hurry to construct and worried at the same time. Sir my property survey no.17/4 & 22/10 site number114 so please confirm is it safe or what....... i already purchased built house in that....done A katha by bbmp near sahadri layout shedahalli village ..
Dear sir, this is in regard to wrong calculations and measurements noticed in s.no.38 of kothihosahalli village, yelahanka north additional taluk. Rajakaluve encroachment map shows the following: (1). scale used for preparing the map : 1 cm = 16 mtrs, (2) Rajakaluve width in cms = 6.2, (3)Rajakaluve width = 10 feet. 4. Total area of encroachment as per the drawing shall be 3200 square feet but the statement shows encroachment as 600feet or 0.06 guntas. The map contains the signature of surveyor, survey supervisor, Asst.EE and thahasildar.whether the wrong calculations were made intentionally or un intentionally to help the apartment built on Rajakaluve at s.no.38.is a question mark. 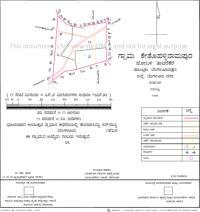 A close look at the kothihosahalli village map in the website clearly shows that Rajakaluve width is about 40 to 50 feet and not 10 feet. People are encroaching all rajakaluve at hulimavu. Please address this issues servy number 30,32,33 rajakaluve has been encroached. i am buying property of site no22 khatha no 28/22 property no 28 in Kr Puram hobli, bangalore east taluk, in document it was mentioned south by kaluve, it is normal kaluve or raja kaluve. AS PER N.G.T. BUFFER FROM THE EDGE OF THE RAJKALUVE IS AS BELOW: FOR PRIMARY DRAIN 50 MTRS, FOR SECONDARY DRAIN 35 MTRS, AND FOR TERTIARY DRAIN BUFFER IS 25 MTRS.PUBLIC ARE REQUESTED TO CHECK THE VILLAGE MAP OF REVENUE DEPARTMENT AVAILABLE AT K.R. CIRCLE OFFICE OF LAND RECORDS FOR RS.10,also VISIT web site landrecords.karnataka.gov.in to know R.T.C. detail where "B "karab means existence of nala or halla can be known. before going for a purchase of any property verify village map. THERE IS A CASE GOING ON IN SUPREME COURT AGAINST N.G.T. ORDER IN DEVELOPED AREAS AND NON EXISTED HALL/NALL. GOVERNMENT HAD TO TAKE STEPS TO FORM A SUITABLE BUFFER POLICY ACCORDING TO DEVELOPED AND NON DEVELOPED AREAS IN EVERY GROWING CITIES. Encroached & sell the rajakaluve property from KSFC Employees Housing Co-operative Society, represented by its President, Vice President and Secretary at kacharakanahalli and lingarajapuram sy. nos.71/1, 74/3, 81/1, 81/4 & 81/2 & sy.nos.16, 17, 19, 20 & 23 respectively at Bangalore North Taluk. Please safe rajakaluve and initiate legal action against culprits. Why the details of BBMP in RERI and mapshalli are not integrated with the GEPTIS of BBMP http://bbmp.gov.in/geptis/web/gis/home Common man can easily understand GEPTIS, so please do the needful for one integrated information system, rather than scattering the details across such portals. Hello Sir, What happens if a secondary kaluve according to the new survey map running across my piece of land. This piece of land is a B Khatha registered property which i purchased 6 years ago and I have been paying property tax since then. Mr. Raj, as per your request I translated the requested document's headline in this manner manner. "Encroachment of water resources in the Yalahanka Division of BBMP limits"
How to determine Primary , Secondary and Tertiary Rajakaluve, Where can we get the details. where is the list of property id under each survey number encroaching each storm water drain available? Halehalli survery no 71 is missing. Please help us to understand on the same. Put 193 survey numbers rajakaluve map first. ..
Hi , Property That I am planning to buy is Survey no 256/2 in Amani Bellanduru Khane village.My question is this survey no 256/2 is not present either in encroachment list and neither in the non-encroachment list thus what should I make out of it. Is it safe to buy this property also this data was last updated on 17th dec 2016 can we trust this data knowing it is not the latest one.Any comment on the same will be really helpful for me. Is HRC Ibbani, Jakkur project notified by BBMP for Rajakalve issue? since we dont know the survey number of the project, unable to check the details from the website. This is a great initiative from IIMB, revenue dept and BBMP and I am sure this is going to help the Bangalore citizens identify their property whether it is in the Swd or how far from it is their property. I wish this initiative was taken few years back. There are so many new technologies available which if used could make the lives of our people great. Hi Team, Survey#: 39 / Horamavu Bangalore East / K R Pura 2 | code: 19065 I could see blue lines passing through survey no:39. One at the sides and the other at the middle. Is it advisable to buy or not. If yes what are all the supporting documents required. planning to buy an apartment in Mangalya prosper Royal county layout Anjanapura. I think it is survey no.57 or 57/4. Is there Raj Kaluve passing thro the project? I am planing to take a flat in Beguru the Lot No / Survey No is : Sy.No.20/3,21,84/1. Kindly check and confirm this property will come under rajakaluve encroachment. I have a site in telecom layout at Billamarnahalli. There is no encroachment details for this village as it is not within bbmp limits but Nala is shown in village map which is adjacent and passing next to my site. The telecom layout is approved by Biaapa and village panchayath. My housing loan has been approved and planning to construct a house in the month of June. Can someone help me how to find out if my site is encroached on rajakaluve or not? 19059 - Kyalasanahalli Village Can you plz share the encroach ment details for this ? Status is showing up as : On a Rajakaluve but not yet notified as encroaching. what does this mean.... there are plenty of sites in this survey number, and more over there is well built RCC wall from BBMP around the vrushbhavati stream, and my site is aproximate 20 meters far from the border. The initiative is indeed very commendable. However, the authorities have woken up to make sure that the residents / owners cannot sleep peacefully. It's a very good initiative , please keep on your good work as it will help common people a lot . Can you please add details for other survey number as well, I am interested in survey # 22 and 23. And thanks for providing such valuable information. Thank you. Please update the details for Kadujakkanahalli Jigani Anekal. Hi, i am staying in Doddanagamagala area nearest to KIADB land, here rajakaluve boundary is not clear, can any one clarify the same, as we are worried about our site here. Please upload Benniganahalli rajkaluve data available with ADLR office. Nice job. But I request to put some red color on survey number which are not good buy so that common user can also understands easily . So that we wont anything related those survey numbers. Rajakaluve details for Horamavu Agara still not avilable. Please uphold for the benefit of the people. Keep up the good work. It would be helpful if people could see their respective properties / sites, whether they come under encroachment.. It is using technology.superb job by BBMP.mark all are sy no where rajkaluve flows. Hi I believe rajakaluves are natural streams and these streams doesn't know the revenue survey maps and cannot decide where to flow and where not. But surprisingly rajakaluve stops abruptly at the one village border and doesnt flow onto adjacent village. Though waterbody/lake resides in the adjacent village map. This requires immediate attention from concerned departments!!! Excellent work. What are your actions for the citizens who are staying in the encroached area? If the survey number is not listed here, what does it mean? Is it safe? If documents of Arakere Village is not available..Who on earth have given them the approval to demolished some shops and houses in Arakere. Will they reconstruct the houses & shops at Arakere Village. 1. Great support BBMP. Thanks. 2. What if the age of the building is more than 5, 10, 15 years old and plan was sanctioned? Ecospace on ORR completely come on SWD! IN ONE SY.NO.SEVERAL SITES WITH BUILDINGS ARE CONSTRUCTED.ENCROACHMENT DETAILS ARE MENTIONED BY QUOTING SY.NO.A RAJAKALUVE CAN NOT BE ENCROACHED BY THE ENTIRE LAND IN A PARTICULAR SY.NO. THEREFORE, IT IS REQUESTED TO MENTION TO WHAT EXTENT RAJAKALUVE IS ENCROACHED BY A PARTICULAR SITE(S) IN ONE SY.NO. The names of the building owners are not forthcoming. If mentioned it will enable to verify it and prepare in advance for vacation of the encroached area. As the area are fully built up it is not possible for laymen to identify by Survey number wise, hence the name of the building owners will be helpful. It is indeed a great work from the BBMP to display the property encroaching on rajakaluve and is most useful tool for all the people to be aware of their hard earned property. We are thankful for them. But at the same time why and how the BBMP officials sanction the plans for building on rajakaluve is to be considered sincerely. The gullible citizens are get cheated by the seller and by investing his life time earning buys the property and on one fine day you people come and smash it. What would be his fate? So please take all precautions before sanctioning the plan and do not allow any building to comeup without your notice. Great work by government! Not many know about it and I guess this should go on to media! How to look for specific properties? Can we have something in english? Thanks for the wonderful work! Can the details given in this portal be used in the court ?? If govt. only does not have the info then how the common people will know what is encroached or not.See the doddathogur area , it shows no data available. Hello, thanks for this website. It helped me for my property. Looks great. Is the data up to date on the website? Thanks for this. It brings in transparency and makes easy the process of finding the required documents. Great website. Helps the public immensely! Queries may be sent to the email address below. Please expect a delay in response due to time constraints. Thank you for your patience. Mapshalli.org A Bangalore citizen initiative to make informational maps accessible to all. IIMB RERI A IIMB research initiative for scientific analysis of the Indian real estate sector.